Quick! Who was the first woman film producer? Back in April we learned about Fort Lee's hidden but critically important contributions to the development of the motion picture industry. It shouldn't be a surprise that the world's first female film producer - indeed the first to own a studio - lived and worked right here in New Jersey. In fact, she'll be inducted into the New Jersey Hall of Fame in October. Her name is Alice Guy Blache, and though she only spent about 20 years of her long life in the United States, her impact on American cinema was both profound and lasting. Her boosters in Fort Lee call her a "reel Jersey girl." Born in France in 1873, Guy entered the early filmmaking industry as a secretary for Leon Gaumont, an inventor who initially was in the business of manufacturing and selling motion picture equipment. To demonstrate his products, Gaumont opened a studio in Paris, producing brief films that were later shown in penny arcades. At the time, that's basically what movies were: "shorts" of a minute or less that showed slices of life like street scenes or athletic feats. The 23 year old Guy saw other possibilities and reportedly asked Gaumont if she could use the equipment for a project. Starting with La Fee aux Choux (The Cabbage Fairy), she was soon turning out movies with scripted plots, becoming the first producer to capitalize on filmmaking technology to tell a story. Using new Gaumont technologies in 1905 and 1906, she even experimented with adding sound to her productions. Guy married cameraman and coworker Herbert Blache, and the pair came to the United States in 1907 to promote their employer's talking film system. The producing bug, however, still stirred inside her. Finding no opportunity to continue directing films for Gaumont in the U.S., she and Herbert formed Solax, their own production company, in 1910. Working first out of Gaumont's Flushing studio, Guy soon found the facilities inadequate for her purposes. It was clearly time to move, and what better place than Fort Lee, the established film capital of the world? Since Herbert couldn't get out of his contract with Gaumont, the couple agreed that he'd stay at his job while Alice managed the construction and operation of the Fort Lee studio. The couple purchased land on Lemoine Avenue in 1911 and a year later celebrated the completion of a $100,000 state-of-the-art studio. Designed for maximum efficiency and productivity, the brick and steel structure was four stories tall, with a film studio large enough to accommodate five stage settings at a time. Glass roof panels let natural sunlight in for more intimate outdoor scenes, while a large outdoor lot was landscaped for larger group settings. At the studio, Guy wrote, directed and produced over 700 films, often giving camera operators and technicians step by step instructions on how to achieve the effects she sought. To calm the nerves of stage-trained actors during their early experiences before a motion picture camera, she reminded them to "be natural," even posting a sign with those words above the studio stage. Guy herself attracted industry attention for her achievements. One trade publication described her as "the presiding genius of the Solax Company... a remarkable personality, combining a true artistic temperament with executive ability and business acumen." Today, film scholars credit her with being the first to use film to address topics including immigration, relationships and homosexuality. While her impact was profound, Guy was effectively out of the film business by the early 1920s. Illness kept her from working for several years after 1918, during which the Solax studios were rented to other production companies. She and Herbert divorced in 1922, diminshing her influence in an industry which was becoming increasingly more and more bureaucratic and focused on commercial success. The studios themselves were making the transition from the East Coast to the sunnier, more temperate climes of Southern California, but Guy chose to return to France with her two children to cast her fortunes there. Still recovering from the devastation of World War I, her native country was anything but a fertile environment in which to rebuild a film career, and Guy settled for a career novelizing film scripts and delivering lectures. Long overlooked for her achievements, it wasn't until 1953 that she received official French recognition with the Legion of Honor. Even her former employer, Leon Gaument, neglected to mention her contributions to his business in his own memoirs. 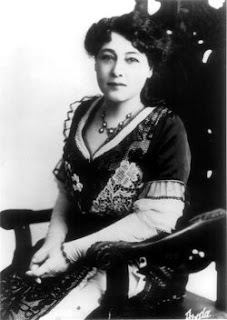 Alice Guy returned to New Jersey in 1964 to be closer to her children, who'd returned to the United States in adulthood. Nearly 95 years old at her death in 1968, she's buried at Maryrest Cemetery in Mahwah. Thanks to the Fort Lee Film Commission, her gravestone now credits her as a film pioneer. The Solax studio building is long gone, with an A&P supermarket now standing in its place, but an informative historic marker invites shoppers to consider the history that was made where they now shop for produce and canned goods.